← This Is Never The Same As That. Once you’ve become a celebrity, what forces you to maintain an authentic connection to your audience? I mean there are appearances you need to make, the product you need to nurture, and financial commitments you have, but there is no real need to befriend a fan or do anything more than manufacture your service. Many celebrities sell a quasi-reality, a supplement for millions of people to digest even if it isn’t all true. Somehow the consumption of their truth makes the fan feel apart of the culture that’s brewed, or it may give a fan an entry to “normal.” Whatever the case maybe, this injection of product isn’t consistent and is lost after a time. This is why when a celebrity goes out of his way to connect with a fan just because he cares, that genuine act is heart felt. Jacques’ been to 32 Roots shows and counting. 35 if you count the two Jimmy Fallon shows he’s attended. 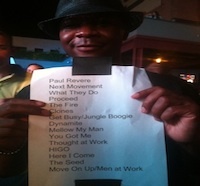 Jacques Powell, a physical education teacher in New York City’s public school system, feels this connection with The Roots. He has been to over 30 shows since becoming a fan 14 years ago. The dynamic group is one of the only Hip Hop groups that still pride themselves on creating original experiences for their audience every time they perform. This is what binds Powell to the music. The rawness he takes in from every live show he’s been to allows him to put his life in perspective, rather than imagining it was something different. There is something powerful about a group that can make you feel the art of Hip Hop when presenting a simple cover song. Their knowledge of music is expansive and their passion to deliver to a live audience embraces the Hip Hop head with love. Jacques’ letter to The Roots and proposal to do his wedding. After recently proposing to his girlfriend of two years, Powell fell back on his experiences with The Roots. He credits their soulful production of “You Got Me” for projecting his soon to be wife into his life. Maybe it was because he constantly listened to the album or perhaps the power of good Karma forced this ironic happening into being. The Roots have many songs about relationships, but in this one the lyrics sends a tingle through Jacques’ spine everything he listens to and Black Thought bellows out, “Somebody told me that this planet was small/we use to live in the same building on the same floor/and never met before/until I’m overseas on tour/ and peep this Ethiopian queen from philly/ taking classes abroad…” Powell believes his long search for the woman of his dreams ended to the tune of “You Got Me,” and may even conjured up his best friend. He met his fiance Keiko under the same circumstances Black Thought describes and in a letter to The Roots says, “We literally lived in the same building on the same floor and never met.” Though their mutual connection was a church and not on a European excursion, their growth together produced a comparable experience. Jacques breaths Roots’ tracks, but wouldn’t see himself as a starstruck fan. Nevertheless, given this extremely abnormal coincidence, it’s only right to have The Roots be a part of his wedding. This story was so touching Jacques and I devised a plan to incorporate The Roots into his wedding.We thought that this band’s entire aura projected love and once they heard the story they’d want to be apart of this ceremony some how. Jacques already wrote a letter to The Roots, but the issue would be how to get it to them. We agreed that along with circulating this story to peek the interest of the Hip Hop romantic, we would also try as much as could to share Jacques’ story with The Roots at as many of their functions we could make it to. 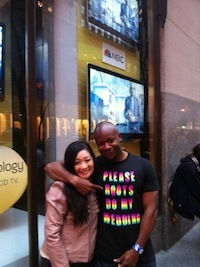 Jacques with Keiko at sporting his proposal shirt after sitting in on a Jimmy Fallon Show taping. Considering Jacques’ wedding is in July, there is little opportunity to encounter The Roots directly. We decided we would buy t-shirts that had the proposal to The Roots on it, and try to go to The Jimmy Fallon Show, a Brooklyn Bowl Event, and the Annual Brooklyn Academy of Music Crossing The Brooklyn Ferry Concert. We could possible meet and speak to one or all of The Roots at any of these events. Last Thursday we were able to attend a Jimmy Fallon Show. Although we didn’t get a chance to meet The Roots even with Jacques wearing his t-shirt lettered in rainbow colors that read “Please Roots Do My Wedding,” we received a lesson in graciousness and genuine love directly from another celebrity, Jimmy Fallon. We were seated in the back of the studio and the cameras barely pick up our faces fully, but Fallon’s frankness and down to Earth personality touched us. He even finished his show by coming into the audience and giving as many people as he could a handshake. That spoke to me, and demonstrated how he could be linked up with The Roots. I also thought maybe this crazy request of Jacques’ could work after all. Jacques is a genuine fan, Fallon and The Roots exude the same genuineness to their fans, and they’ll probably find this story. We left that show without meeting The Roots, but we have a few more opportunities to make it happen. There isn’t much that can separate the genuine vibe manifested from great music and great spirits. i hope they do his wedding. if they don’t, i hope it’s because they couldn’t make the time. not because they feel it wasn’t worth the time.